Editor-curator for this cross-century book of some of the world’s finest works is Scott Gutterman, deputy director for Neue Gallerie of New York, and frequent writer for Artforum, The New Yorker, and Vogue publications. He provides the book’s short introduction, and then we are set free to browse and meditate over the paired works, each given a full facing page. Gutterman points to the idea of “transformation” as central to the form as one work of art passes into another. 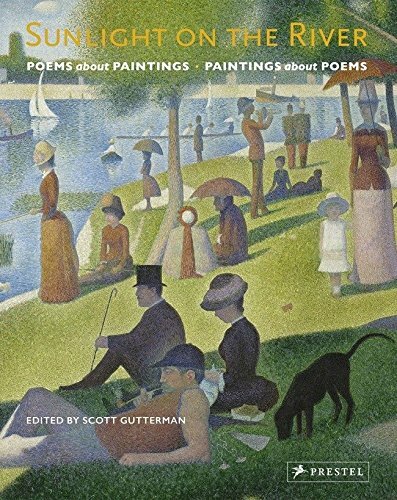 “The poem and the painting fused into something greater; a meditation linking thought and feeling, the literary and the visual.” And so not only is the painting transformed in the poet, but the reader-viewer is transformed through a new and richer perception of both. He speaks to the variety of approaches that the poets can make based on elements of theme, image, drama, emotional color, and often odes to the painter-painting such as Wallace Stevens's "The Man with the Blue Guitar," a meditation on Picasso’s iconic painting. He also notes the many painters who have based their work on poems such as Robert Rauschenberg painting based on Dante, Francis Bacon’s based on T. S. Eliot, Joan Mitchell’s based on a James Schuyler poem, J. M. W. Turner’s based on a Herman Melville poem “The Temeraire,” and many more. Of particular note are the several poems of William Carlos Williams based on scenes from Peter Brueghel large canvases. And, of course, there are works from the New York Poets scene such as the work of Frank O’Hara, Mike Goldberg, and Larry Rivers. He succeeds wonderfully in this rich collection that sings in three forms: painting, poem, and painting-poem combination. Larry Smith is the author of Lake Winds: Poems (2014), Kenneth Patchen: Rebel Poet in America (reprinted 2012), Lawrence Ferlinghetti: Poet-at-Large (1982), and The Thick of Thin: Memoirs of a Working-Class Writer (2017). He is also the publisher at Bottom Dog Press.